Our Spotlight this month focuses on Nicole Bellow, founder of the Houston-based HR consultant company, Smarter HR Solutions. 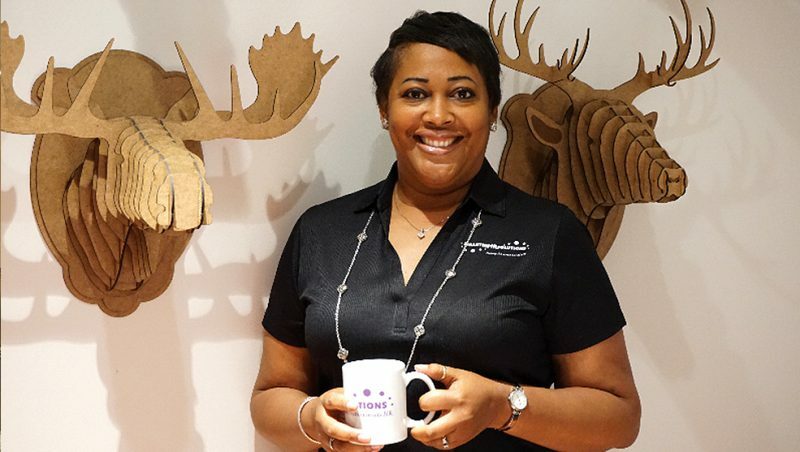 With her Houston office space located at 1322 Space Park Dr, Nicole has set out on her own to provide her clients tailored HR solutions for their businesses, backed by her 20+ years of experience in the HR industry. 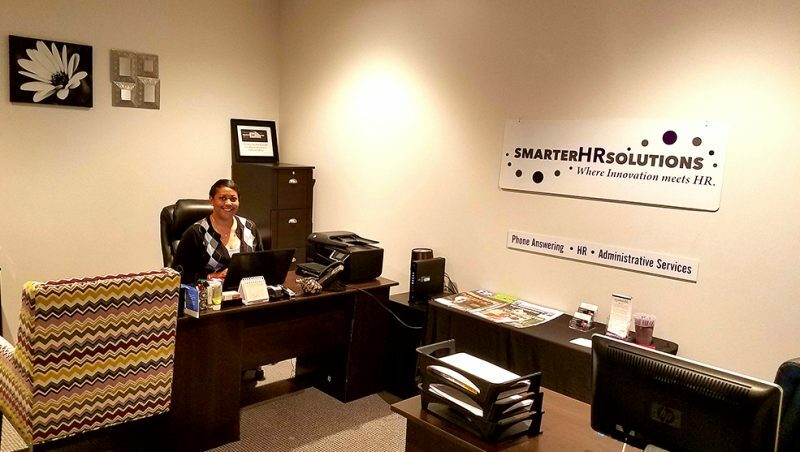 Learn more about the various HR services Smarter HR Solutions provides, what inspired Nicole to start her own HR consulting business and how Boxer Property was able to assist her in finding an office that was perfect for her business. Nicole Bellow, Founder & President of Smarter HR Solutions. Tell us about Smarter HR Solutions. Nicole Bellow with Senior Safety Consultant, Ted Bellow. We are a team of Human Resource consultants providing outsourced HR solutions for small to medium­-sized companies who normally don’t have the resources to hire a full­time HR professional. For a fraction of the price, we offer outsourced solutions to those companies with our HR retainer packages. Our clients have a bank of hours that can be used per month at their discretion for services such as employee handbooks and employee relations. Starting this summer we will start rolling out phone answering and administrative services for solopreneurs and small business owners, as well. Our specialty is providing our clients with HR guidance. Once they start hiring employees it’s very important to have an employee handbook with rules and regulations. We aim to take care of those tasks so that our clients can spend more time growing their business and be more profitable instead of sitting behind their desk doing paperwork all day. Normally, our main clients range from small to mid­-sized businesses, but when a company grows to have 50 or more employees they really should have a HR professional on staff. Right now our clients are companies that have a range of 5-­7 employees to 25-­30 employees that utilize a range of our HR services. We have also assisted larger companies on projects such as recruiting, safety training, including OSHA 10 & 30, and mock audits. What is the history behind Smarter HR Solutions? I’ve been involved in the Human Resources field for over 20 years. I’ve worked in various industries such as banking, oil & gas, healthcare, and education. Before I started my own business, I was working at a Home Health Care Agency that employed over 650 people. In the beginning, it was quite challenging because they never had an HR professional there before. It turned out that the owner had been taking care of all the HR tasks ever since the company had 3 employees all the way to when they had over 650. Many of the processes were outdated and not size appropriate. Normally at a large corporation, an HR professional specializes in a certain role and handles one task at a time whether that be benefits, compensations, etc. I took on more of a generalist role and by doing so I was able to save the company $350,000 off the top just by making simple changes. I told myself, “If I can do it for this company, I can most definitely do it for other business owners”. Nicole Bellow’s Office Space at 1322 Space Park Dr.
My experience with my former employer really made me think about how I could work with small to mid-­sized companies to show them how they can be more profitable, save money, and be more efficient by curving some of their costs. I wanted to show that by outsourcing their HR tasks, businesses can spend more time focusing on their core. I find that sometimes it costs a lot more money to do everything yourself. Many companies outsource different parts of their business and they’re doing it for a reason: it’s simply more cost effective. That’s what got me into what I’m doing today. I figured if I can do it for this large company and take it from paper to digital, I can do it for anyone! What has your experience at 1322 Space Park been so far? I love the space that I’m in right now. It’s so convenient to be near the conference room and waiting areas. I like the fact that you can move offices within Boxer very easily. The fact that Boxer is flexible and works with businesses who are growing is wonderful. I also like that I can travel to Houston and reserve a conference room at any Boxer location if I needed to meet with a client. 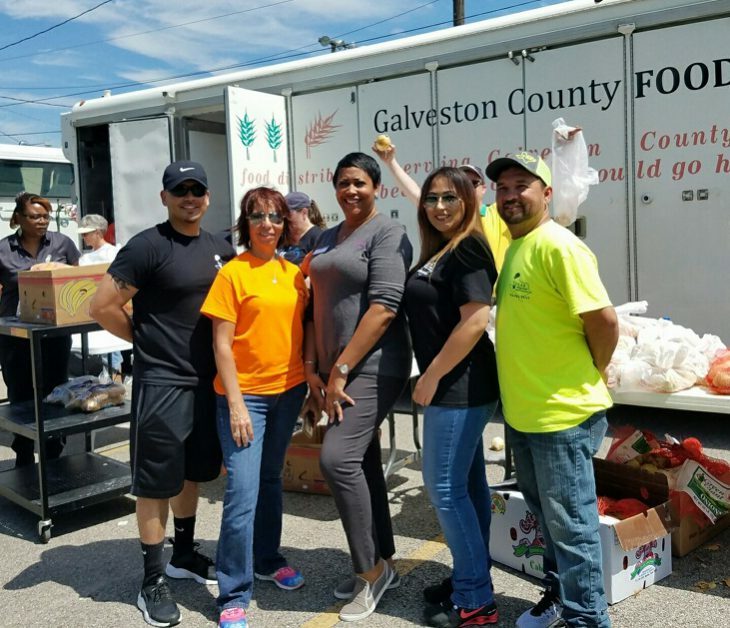 Nicole (Center) Volunteering at Galveston Food Bank with Safety Team Partners, Texas Regional Safety Services. 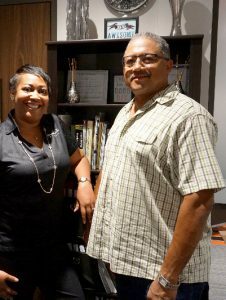 How did Smarter HR Solutions come to be at 1322 Space Park Dr? Actually, when I first started Smarter HR Solutions our office wasn’t at a Boxer Property location and I was still working for my former employer. It was only when I decided to work full­time for myself that I realized the office space there wasn’t optimal for me or my business. I started looking elsewhere for an office in the Clear Lake area and I found 1110 NASA Parkway. Eventually, I started looking to grow my office space and that’s when I spotted 1322 Space Park Dr. I stopped by the property for an open house and after looking around I thought the space was absolutely gorgeous! What I really liked is how I got cooperation from the staff at both 1110 NASA Parkway and 1322 Space Park. The leasing agents at both properties worked together to make sure I found a space that I really liked and to make sure the space was a good fit for my business. They were very patient because I looked at pretty much every single space available at 1322! The team at 1322 knew what my other space at 1110 was like so they took down measurements for me to make sure everything would fit. When they gave me an extensive tour of the building I got a chance to see some the other businesses that were there, as well. How effective has Boxer Property been at meeting your needs? I think it has been very effective! I really like what I’ve seen and the help that I’ve received, like the staff at Boxer helping me select a space. What I like is that I’m able to tell them what I want to do along with where and when I see the growth in my company. They were able to tell me which office spaces were a good fit for my projected growth and they gave me the option to always move up if I needed to. They educated me on square footage and space requirements as well. I found the entire experience to be extremely helpful. 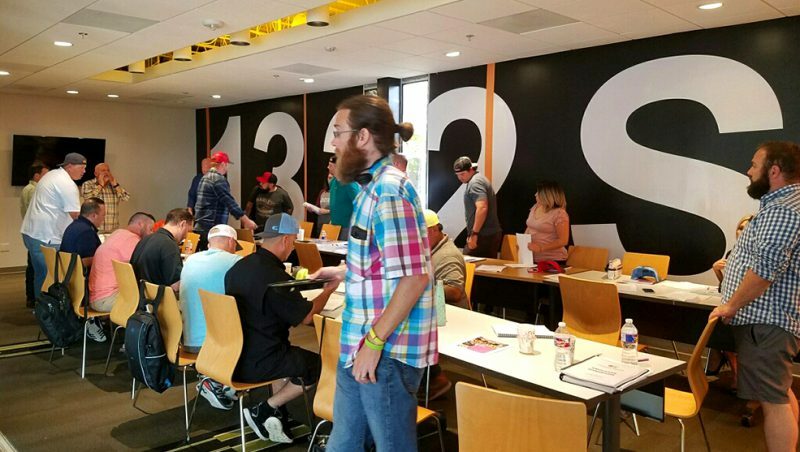 Smarter HR Solutions Holding an Orientation for a Client’s Employee Handbook in a Conference Room at 1322 Space Park Dr.
What Boxer Property offers is huge when it comes to amenities. I really like having the ability to use the meeting space, being able to book a conference room in another location, and using the large training room available here which I love! I haven’t really seen amenities like these available anywhere else. What are your top business goals for 2017? To grow and penetrate the market! For the first two years I wanted to see if my business idea would work and if I could actually get clients. Now, I know that I have a product that people are interested in. I believe small to mid­-sized companies would like to know what they’re spending on a per month basis. If they are shown a set price and they know what they get for that amount, they can easily budget for that. Now that I have that down, it’s all about growing my business especially in the Houston market! Learn more about Smarter HR Solutions and their services here.